This set is a compilation of performances recorded in different European cities during The Tour, which took place between 1976 and 1977. Following Volume 1 (HighNote HCD 7291), it offers a welcome shift in the narrative arc and trajectory of the band's development as well as a kind of a portrait or snapshot into the historical development of jazz at this particular time. 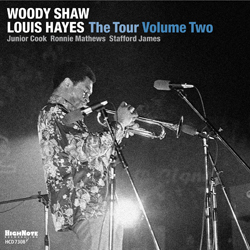 Much is to be gleaned from the masterful treatment and sense of ownership over these compositions exhibited by Woody, Junior, Louis, Ronnie, and Stafford. The seasoned, almost seamless manner with which these pieces are covered speaks masterfully to a level of reverence and unrelenting commitment to tradition that belies all claims (by omission) of deceleration concerning jazz's momentum during the 1970s. As Woody put it in an interview referencing this very group "by no means is jazz dead." Clearly, this release proves him right.